"Jim Kabbani assisted and guided our credit union to the road that will lead to our success. He made my job as a CEO a lot clearer and easier. Thank you!" Jim's focus is on making the CEO's job easier. He solidified his belief in the power of strategic planning while working in the world of venture capital as a Managing Member of a DC-area early-stage tech fund. 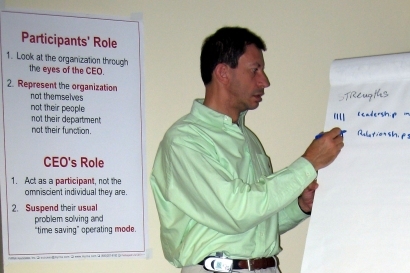 His frequent strategic planning facilitation with the executive teams of the fund's 14 portfolio companies highlighted the profound impact of having the entire team on the same page with a shared sense of where they were, wanted to be in the future, and the action they had to take to get there. Having worked with Myrna Associates on individual projects over the years, it was a natural transition to join their elite team of facilitators. He has played a broad range of key roles in multiple business sectors: leading the US salesforce of a European telecomm leader, facilitating a health care software company's negotiation and acquisition of a portion of a rival firm's product line, thus re-framing their relationship from adversarial into cooperative, developing and executing win-back campaigns. In the Federal arena, Jim facilitated Martin-Marietta Data Systems transition from declining Timesharing business into a booming Systems Integration practice. He then facilitated several US software vendors in establishing a Washington DC presence and win record-breaking government contracts by teaming them up with 8(a) firms. He created and managed the early sales organization of Blackboard Inc., propelling the company from a tiny startup to one of 2004's most successful tech IPO's. Then as Executive VP of WiSE Technologies, he facilitated the transformation of a minority-owned startup into the operator of the largest number of Airport Wi-Fi hotspots in the country and a sought-after acquisition candidate by teaming them up with leading global partners like HMS Host Marriott and the Trump Resorts organization. Jim grew up in embassies around the world. (His father was a much-admired Ambassador.) Capitalizing on the opportunities that upbringing provided, he became fluent in four languages, gained a multi-cultural flexibility, and imbibed hours of candid dinner table conversations between the world's top government officials. Their unvarnished insights into how the world really works served him well as International Sales Manager for STSC, where he met John Myrna, and then as co-founder of USA Direct Software, an international software sales consulting firm. He accumulated an enviable track record by creating highly successful sales and distribution networks in over twenty countries. Jim's business career began at age 7, when his parents refused to buy him a badly-wanted toy. Anticipating eBay's business model, he setup a sidewalk stand and sold enough of his older toys to buy the new one himself. Building on his initial success, he broadened his product line with lemonade and popcorn to generate a consistent toy funding source. He is a long-time resident of the Washington, DC area and is the father of two incredibly beautiful and intelligent girls with whom he shares his enjoyment of travel, aquatic sports, family activities, and pizza.